Here’s the press release from the RallyCar Series summarizing the final results of the first round of the Rally America National Championship, the Sno*Drift Rally in Atlanta, Michigan. It was quite an epic story for Super Production driver Travis Hanson as he became the first SP competitor to claim an overall victory. Shaun will have more commentary and insight into this phenomenal achievement later today in his Sunday Service Park column. Atlanta, MI (January 30, 2011) — Travis and Terry Hanson win the Sno*Drift Rally in Atlanta, Michigan, the opening round of the 2011 Rally America Championship. The Hansons piloted their 2007 Subaru Impreza WRX STi to victory with a huge lead of 3 minutes and 53.1 seconds over Subaru factory driver Dave Mirra, who took 2nd overall in a 2011 Impreza WRX STi with a total time of 2 hours 31 minutes and 13.6 seconds. Rounding out the overall podium was Joseph Burke, who finished only 5.2 seconds behind Mirra in a 2006 Mitsubishi Evo 9. A triumphant Hanson made U.S. rallying history today by being the first-ever Super Production class driver to win a National Rally America event outright! Even more significant, Hanson was able to accomplish this feat as a privateer with limited support. Hanson was able to gain an advantage on the first day of the rally when front-runners Antoine L’Estage and David Higgins both retired, leaving him with an overnight lead of four minutes. Hanson drove a flawless rally and maintained a pace that kept him head and shoulders above the rest of field for the remainder of the event. In the fight for second place overall, Subaru Rally Team USA’s Dave Mirra and his new co-driver from the UK, Marshall Clarke, were able to battle back from being dropped to fifth due to a tire puncture late on Day One. Mirra was able to gain a few precious seconds on Joseph Burke during the penultimate stage of the rally, giving him the edge to claim his best career finish to date. 2010 Rally America Rookie of the Year Joseph Burke placed third overall on his first time competing in Open class. Despite his limited experience on snow and ice, Burke overcame the setbacks he encountered on Day One to maintain second position overall throughout most of Day Two and battled Mirra to the very end before slipping back to third. Burke was the only remaining Mitsubishi driver to finish the event and also placed second in class. Of the eight Super Production crews entered in Sno*Drift, three finished within the top five overall. After Hanson, Roman Pakos and co-driver Maciej Sawicki claimed second in class and fourth overall with a time of 2 hours 34 minutes and 32.4 seconds. Pakos finished 2 minutes and 46.5 seconds ahead of husband and wife team and 2009 Super Production Champions Jimmy and Melissa Keeney. The Keeneys placed third in the SP class and finished fifth overall on the season opener. New to the Super Production class for 2011 is ex-factory driver and two-time MaxAttack! 2 Wheel Drive Rally Series Champion Lauchlin O’Sullivan. O’Sullivan and co-driver Scott Putnam experienced a series of setbacks starting early in the rally that saw them drop to 20th overnight, but they managed to climb up the standings and end the event placed 11th overall and fourth in class. 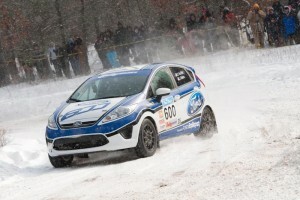 In two-wheel-drive competition, Dillon Van Way had a successful outing in his new Ford Racing Fiesta R2, finishing 38.1 seconds ahead of 2010 2WD Champion Chris Duplessis. Van Way took to Michigan’s snowy stages without having previously driven the Fiesta R2 and was able to run a clean rally alongside his new co-driver Jake Blattner and place 8th overall. Also driving a car making its competitive debut at Sno*Drift was Chris Duplessis in the Scion Rally xD. Duplessis and co-driver Catherine Woods finished second in 2WD and 10th overall after starting Day Two in 21st place due to a puncture that had cost them 10 minutes the day before. Chris Greenhouse and co-driver Phil Marsh were the next fastest 2WD crew, finishing about 4 and a half minutes behind Duplessis after incurring a 2 minute 40 second penalty for being 16 minutes late to a Re-Group Control. Greenhouse placed 12th overall in his 1995 Plymouth Neon. Mazda driver Erik Zenz and co-driver Dave Parps won the Drift Regional Rally on Saturday, posting a time of 1 hour 17 minutes and 14.2 seconds. Zenz finished 22 seconds ahead of Henry and Cynthia Krolikowski, winners of Friday’s Sno* Regional. In third place was Matt and Andrew Bushore, finishing 6 minutes behind Zenz.